This is one of the first recipes I can honestly say that I made up, playing with three different chili recipes and two soup recipes. To get to this version, I've tried (among other spices) curry powder, cinnamon, shoyu, Bulldog Tonkatsu sauce and vinegar. 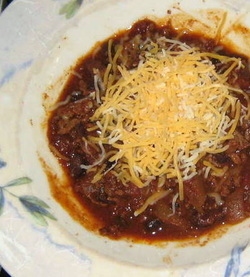 This is good 'chili-dog' chili and can also be used as the base for making some killer nachos. In a dutch oven or soup pot, cook garlic and Portuguese sausage. Add ground beef (or turkey) and brown well. Add onions when the ground meat is cooked. Add everything else. Use sugar and Worcestershire to your taste. Simmer for an hour, and ideally, 2-3 hours.